Walking distance to Camelback ski slopes and Camelbeach water park. 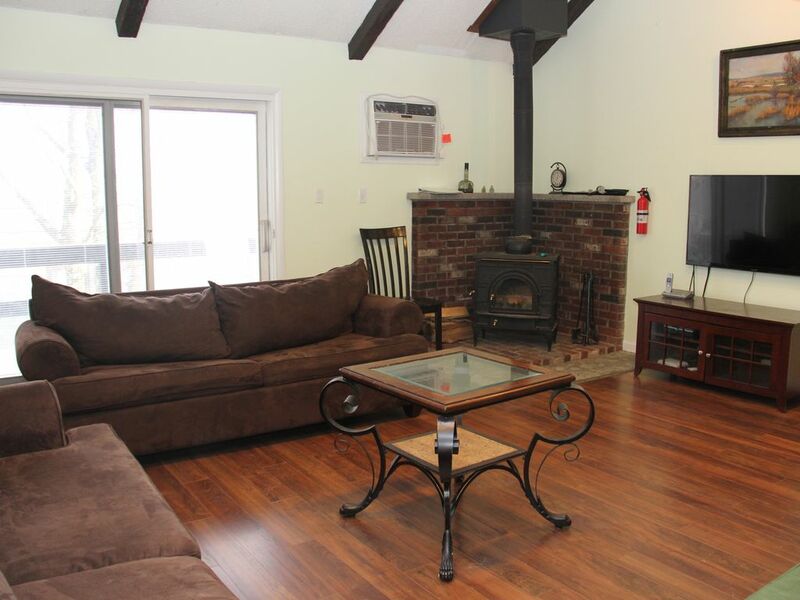 Spacious 3 level townhouse features a cozy wood burning stove, 3 Dish TV with over 250 channels, Internet and computer, DVD player. Surround sound system. Parking lot level. The dining area has seating for 8 next to a full kitchen and a ½ bath all on the same floor. The outdoor deck has a gas grill and patio chairs. There are multiple bedrooms to accommodate up to 12 people. Upstairs there is a loft bedroom with a queen bed, Dish TV and a full bathroom. Below the main level are 2 bedrooms (1st has 2 sets of twin beds and a twin pull out. 2nd bedroom has a bunk bed with full futon bed and 2 twin, Dish TV), washer/dryer, and full bathroom also on this level. Living has a Sofa bed also a Sat TV, DVD. The Clubhouse has an indoor pool, jacuzzi, saunas, tennis court (indoor and outdoor), indoor basketball and weight room. The Village at Camelback is a privately owned, four season townhouse community, located on Camelback Road in Tannersville, PA., in the heart of the Pocono Mountains. Offering indoor heated swimming pool, Jacuzzi, saunas, gym, indoor and outdoor tennis courts and much more. Cold weather enjoyment is assured with skiing from slope side town homes. In addition, snowmobiling on winding mountain trails, cross country skiing through beautiful woodlands; horse drawn sleigh rides and ice skating are all nearby. Warm temperatures provide the newly designed Camelbeach water park just minutes away, along with hiking, mountain biking, horseback riding, tennis, golf, fishing, hunting, flying, boating, white water rafting and canoeing. Village at Camelback in the Poconos! This is one of the true ski in ski out homes in the Poconos! The Village of Camelback townhomes are as close as you can get to Camelback ski area and Camelbeach water park. The Village at Camelback offers it's own amenities... Indoor and outdoor tennis courts, indoor pool, sauna, whirlpool, and weight room. Nearby activities include, Skiing, snowboarding, snowmobiling, paint ball, hiking, rock climbing, golf, tennis, amusement parks, hunting, horseback riding, shopping, the Crossing outlet mall, restaurants, brewery, just minutes to Pocono Raceway, whitewater rafting, biking. The first disappointment was that we choose this rental because there was a pool. No where in the advertising did it say it wasn't open during the week. We checked in to find it was closing in 15 minutes and wouldn't be open the remainder of our stay. My kids were super sad. First impression as we arrived was the outside of the rental was filthy. Cigarette butts and garbage all in front of the parking spaces. The condo was very dirty. Dirty smears on the glass doors, splatters all over the walls, the oven and cook top was dirty. Whoever does the cleaning does not make any effort and there are dust balls hanging from the popcorn ceiling. It needs a completed spring clean from top to bottom. Dirty smudges on light switches and commonly touched places. One of the toilets had not been cleaned. Cleaning someone else's house is not my idea of a vacation but it drove me crazy. The bed in the master bedroom was a solid rock and may have just been a box spring not a mattress. Also missing some basic amenities that other homes have like scissors, measuring spoons and cups and bowls. Needs a coffee table. The location is great but this place needs some love. Most likely it is rented to many people that abuse it and not a quiet family of four like us. Said to call the owner upon check out yet no contact information. Even my kids noticed the dirt. The house was very close to the ski slopes and the waterpark. There were enough beds for our group. However, it was not very clean. Great place! Clean and spacious. The property was perfect for our family. We were close enough to walk to the slopes. This was my 1st time not renting a hotel and it did not disappoint. House was clean and very spacious. Great for families. Will def go back!! It was was very clean. Plenty of room for the seven of us. Kitchen had almost everything we needed. Could use some roasting/baking pans. Owner was helpful. The house is very spacious and well accommodating. It was the perfect home for me and my 10 friends for our weekend getaway. Definitely will stay here again! The Crossings Outlet Shopping is a short drive away. In the winter time, Camelback downhill skiing, snow tubing and snow boarding are a few minutes drive. In the summertime, Camel beach water park is a few minutes drive. Whitewater rafting can be found at the Delaware Water Gap about 12 miles away, along with canoeing and kayaking. Mountain biking, hiking, horseback riding, fishing and golfing are all found within a 15 mile radius. These activities make this a year-round destination, so don't limit yourself to just winter, come stay at our place during the other seasons too. Casino gambling has arrived in the Poconos, 15 minutes away. Ski: Walking distance to Camelback ski slopes and Water Park. The house has room for 12 people.